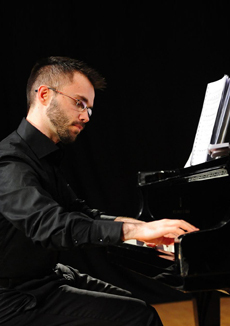 Diego Procoli obtained his degree in piano performance, with honors and special mention, at the Conservatorio Alfredo Casella in the city of Aquila. He studied there with Elena Matteucci and furthered his studies with Konstantin Bogino, Nina Tichman (at the Musikhochschule Köln), and Orazio Maione. Mr. Procoli has taken special courses in fortepiano and harpsichord with Andrea Coen, studied musicology at the Sapienza University of Rome, and was rehearsal pianist with Robert Kettelson at the Accademia Nazionale di Santa Cecilia in Rome. Mr. Procoli has performed as solo pianist, as well as with chamber music ensembles, for important associations and venues both in Italy and abroad, such as the Società dei Concerti Barattelli dell’Aquila, I Solisti Aquilani, l’Accademia d’Ungheria in Rome, the Instituto Italiano di Cultura Budapest, the German Historical Institute, the Accademia Filarmonica Romana, the Reate Festival of Rieti, the Accademia Nazionale of Santa Cecilia, the Auditorium della Conciliazione di Roma, and RAI—Radiotelevisione Italiana (Italy’s national public broadcasting company).